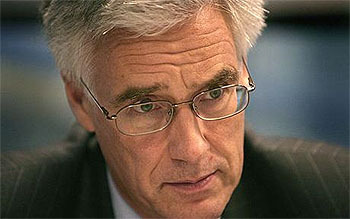 In a searing critique of the industry, Lord Turner described much of the City’s activities as “socially useless” and questioned whether it has grown too large….”The really fundamental question is whether the overall level of financial services pay is a consequence of the swollen financial sector which has resulted from oversimplistic financial deregulation. This is not a question that any of the politicians have focused on but I think it’s an important and legitimate issue of public concern,” he said. ….He told Prospect: “If you want to stop excessive pay in a swollen financial sector you have to reduce the size of that sector or apply special taxes to its pre-remuneration profit. Higher capital requirements against trading activities will be our most powerful tool to eliminate excessive activity and profits. Italics mine. The FSA didn’t exactly cover itself in glory during his predecessor’s term, so maybe Turner is just talking tough because he wants to keep his job. But if that’s what it takes to turn a technocrat into a populist, then that’s what it takes. I sure wouldn’t mind hearing a harangue like this from an American regulator once in a while. As for the transaction tax, I don’t know how practical that is. But if it can be made to work, it’s a good idea. Not only would it raise some money, but it would put a crimp in some of the most highly leveraged investment schemes, which fundamentally depend on tiny returns multiplied by billions of dollars. A transaction tax would make a lot of them unprofitable. So it’s a twofer.